Amazon Samsung Carnival: Discounts on Galaxy C7 Pro, On7 Pro, On5 Pro smartphones..
General News: Amazon Samsung Carnival: Discounts on Galaxy C7 Pro, On7 Pro, On5 Pro smartphones..
General News Amazon Samsung Carnival: Discounts on Galaxy C7 Pro, On7 Pro, On5 Pro smartphones..
As part of the Samsung Carnival, Amazon is offering deals and discounts on Samsung’s line of smartphones, large home appliances and LED TVs. 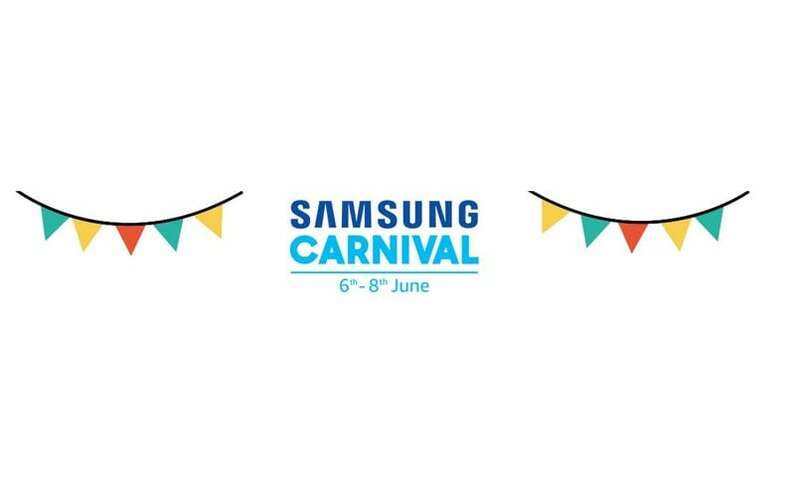 The Samsung Carnival kicks off today and will run until June 8 on amazon.in. Under the three-day sale period, customers can avail heavy discounts of up to Rs 4,000 on the Samsung Galaxy C7 Pro and up to 20 percent off on split AC and full HD LED TV. It is worth mentioning that in addition to the discounts, Amazon also has a GoIbibo Offer on select products where customers can enjoy up to Rs 5,000 off on flights and hotels. So for example, you purchase a Samsung smartphone during the carnival period, you will receive a discount code which can be used to avail an instant discount of Rs 500 on domestic flight bookings of Rs 4,500 or more on GoIbibo and a hotels voucher worth Rs 2,500 on domestic hotel bookings of Rs 4,000 or more. Once users complete a flight booking with the coupon code, they will be instantly awarded and additional Rs 2,000 GoCash. This brings the total discount value available to customers to Rs 2,500 on flights and Rs 2,500 on hotels. Here’s a look at key offerings under the Samsung Carnival on Amazon. Under the Samsung Carnival, Amazon is offering the Samsung Galaxy C7 Pro at Rs 25,990, after a discount of Rs 4,000. The highlight of the smartphone is the 16-megapixel camera both in the front and rear, along with 3,300mAh battery and 4GB of RAM. If you purchase the Galaxy C7 Pro, you can further avail the GoIbibo offer worth Rs 5,000 off on flights and hotel bookings. Additionally, there is also an exchange offer available with the smartphone worth Rs 13,070. The Samsung Galaxy On7 Pro is available at Rs 8,740 following a discount of Rs 750. But if you exchange an old smartphone for this, you can further avail up to Rs 6,712 off on the purchase. The GoIbibo offer is applicable on the Galaxy On7 Pro as well. The Samsung Galaxy On5 Pro is one of the affordable Android smartphones with dual SIM and HD display. Originally priced at Rs 7,990, you can buy the smartphone under the sale at a discount of Rs 750. In addition to the GoIbibo offer, you can also avail the exchange offer where you can barter an old smartphone for the Galaxy On7 Pro and get a discount of up to Rs 5,750. Similar to the Galaxy On7 Pro and On5 Pro, the Galaxy On8 is also available at a discount of Rs 750, which brings the cost to Rs 12,740. Furthermore, you can exchange an older smartphone for an additional discount of up to Rs 9,999. Other benefits include the GoIbibo offer. Under the Samsung Carnival, Amazon is also offering no cost EMIs on select Samsung products. These include the Galaxy J7 Prime. The smartphone is priced at Rs 16,900. If you buy it with exchange, you can further avail up to Rs 13,070 on discount. Although the listing doesn’t explicitly mention ‘no cost EMI,’ Amazon is offering the interest paid back as Amazon Pay balance if the product is purchased through credit card EMI from select sellers. One must read terms and conditions of the offer before making the purchase. Other Samsung products in the no cost EMI scheme include the Samsung Galaxy J2 Pro which is also available at an exchange discount of up to Rs 7,800, the Samsung Galaxy J5 Prime which has an exchange offer of up to Rs 11,062, and the Samsung Galaxy C9 Pro which has an exchange discount of up to Rs 13,070. Although the Samsung Gear S3 is mentioned under the no cost EMI offer, the product listing does not show any discount, no cost EMI, or bank offers. Both the Classic and Frontier edition are priced at Rs 28,500. Samsung Direct-cool single-door refrigerators are available at up to 22 percent discount while the frost-free double-door refrigerators with 3 Star Rating are available with a discount of up to 20 percent. The Samsung Direct-cool Digital Inverter single-door refrigerator is available at up to 15 percent discount. To help you battle the summer heat, the carnival also has lucrative offers on Samsung’s range of split ACs. You can avail up to 20 percent off with free standard installation if you purchase Samsung Split AC of 1.5 Ton with a 5 Star Rating. If you purchase one with a 3 Star Rating, you can avail up to 18 percent discount. The Samsung Inverter Split AC can be purchased at up to 10 percent off. A fully automatic Samsung 6.2kg top-load washing machine is available at up to 15 percent off while the 23 litre Samsung Microwave Oven is available at up to 14 percent off. As for the LED TVs, the discounts start at 25 percent off on 24 inch HD ready LED TV and go up to over 30 percent off on a 40-inch ultra HD smart LED TV. Current time: 04-22-2019, 11:50 PM Powered By MyBB, © 2002-2019 MyBB Group.